You Should Get Yourself a Google Glass too! Woke up early today as usual, but some really cool thing made this day a little bit extraordinary. I’m wearing my Google Glass! Who wouldn’t be jumping with excitement if you find yourself being one of the lucky guys who gets to have a Google Glass? So, I zipped through all my morning rituals preparatory to driving the kids to school and hauling me and my wife to work. As I drove away with the Google Glass, I felt like I’m the Iron Man…going around with any information I desire displayed in front of me at my bidding. As I never trust my memory that much, I always input my reminders on my phone. So, prior to taking off, I triggered the reminders on my phone via voice command and lo, all reminders for today flashed before me as if the windshield and the view in front was my desktop display. Man, I love technology! BBJames, my freshman high eldest kid, is doing some last minute cramming for the math quiz today, so I decided not to turn on the stereo. Instead, I commanded to play music and I got Survivor’s “High on You” pulsing through the earphones immediately making my day even better and more upbeat, as if the Google Glass alone is not enough to make it so. As I was cruising midway to school, I got a message from my boss asking me to bring the camera as we need an extra one for the various activities in the office we need to document. Alas, turning back home is out of the question as it would take time and gas to do that. So I responded via voice command to text back with “Sorry boss, I’m already in the office parking lot. Perhaps Allan is still at home, ask him to bring his cam instead.” Beep. Sent. As the gates of Xavier University loomed before me, I thought to invoke its history and lo, I was presented with a summary of its story. Who founded it, in what year, and even a picture of the first school building. Wow, this is amazing. The Google Glass should, even this early, be banned at all schools as students could always encode beforehand their data and lessons and just call them up during quizzes and exams. Another beep, and a call icon with my 20-year old assistant’s face showed up in the upper right corner of my view. Then, a little box appeared at the bottom part of my windshield and Trixie showed up smiling, brushed and flushed, plunging neckline and all, sitting at her desk in the office. And with a wink, she signed off. Wow, I hope I can afford it, whatever it is she decided to want for Christmas. Wait! I don’t have an assistant! And if Trixie’s real, my wife will scratch me with wolverine claws to death! And I woke up with a start. Six o’clock! So, this is what happens when you think so much of some really cool gadget like the Google Glass before you go to sleep in the evening. 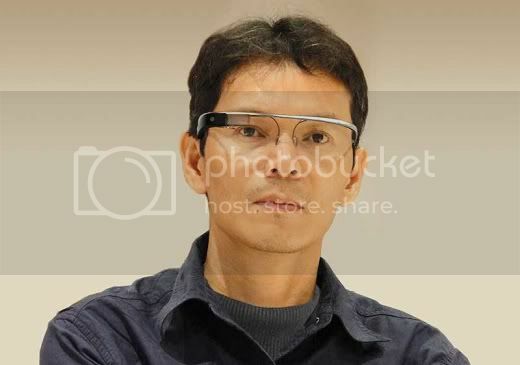 But hey, the Google Glass is not just some dream gadget. It’s real and it’s coming very soon. In fact it’s not only Google that’s coming up with it, but also some other company called Vusix which has produced their prototype of the Smart Glasses M100 which somehow looks to have a better finish and style than Google’s. Here are a couple of videos about the google glass, in case you haven’t seen them yet.